Cecil Beaton designed and wore this 18th-century-style jacket, with surreal touches, for a fête champêtre he hosted at his country house, Ashcombe. Gordon Anthony photographed him wearing it, gazing into a flower-framed mirror with a rabbit mask on the back of his head. Cecil Beaton compiled a significant part of the V&A's Twentieth Century Dress Collection. This jacket is shown here to acknowledge this important contribution and to reveal how the collection inspires designers. 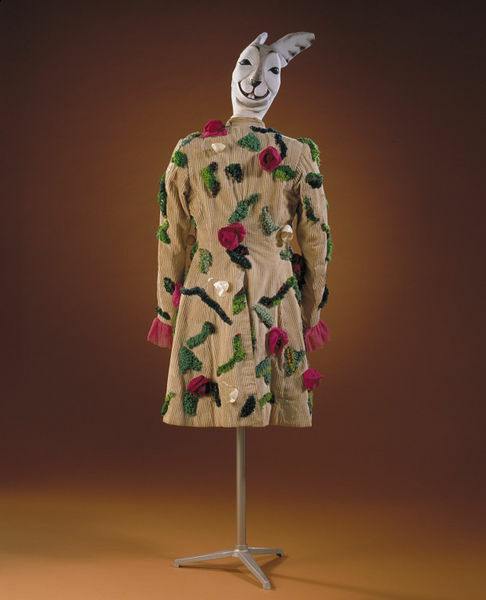 Cream corduroy coat decorated with applied muslin roses, irregular shaped pieces of woollen yarn pulled through canvas, and cellulose nitrate egg shells glued to PVC egg whites. 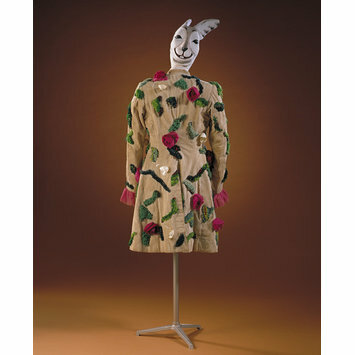 This coat was worn by Cecil Beaton in 1937 for his Fête Champêtre party at Ashcombe House, his home in Wiltshire. A copy of Gordon Anthony's photograph of Cecil Beaton wearing this coat is in the National Portrait Gallery's collection (NPG x126402). Cecil Beaton designed and wore this 18th-century-style jacket, with surreal touches, for a fête champêtre he hosted at his country house, Ashcombe. Gordon Anthony photographed him wearing it, gazing into a flower-framed mirror, with a rabbit mask on the back of his head.